Hey guys! Sorry for my absence the past week, I had an exam that was supposed to be last week and then got moved to Monday after we got snowed in, and overall it's just been a crazy week. Today is our fourth snow day out of the last five weekdays, it's crazy! That is the nice thing about still being school - even medical students get snow days! Today I wanted to share with you Zoya Nyx from the Pixie Dust collection. This is a periwinkle blue with silver glitter in a matte, textured finish. It applied nicely and took three coats for full opacity. Like the OPI textured polishes, this doesn't really feel all that rough when it is dry like you might expect it to. I wore it for several days and didn't have a problem with chipping either, which I was a bit concerned about. I didn't try this one with top coat yet but I am sure I will wear it again and might give that a go. I wasn't too sure about the textured trend when it started but I am really loving it now. I didn't get any more of the Pixie Dust polishes but I might have to consider picking up a few more. I am excited to see how this trend evolves over the year! Good morning! 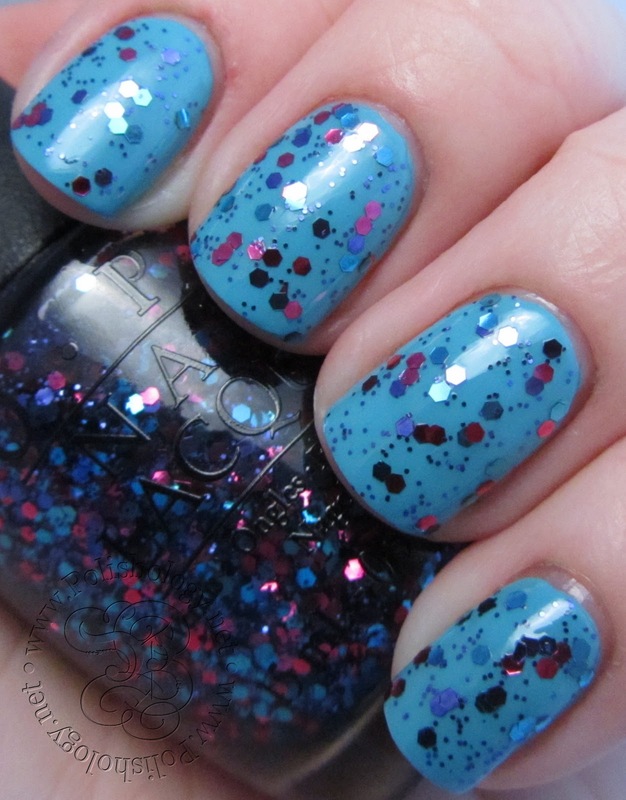 I wore this polish sometime last spring, but somehow never got around to getting it up on the blog. It is too pretty not to share. 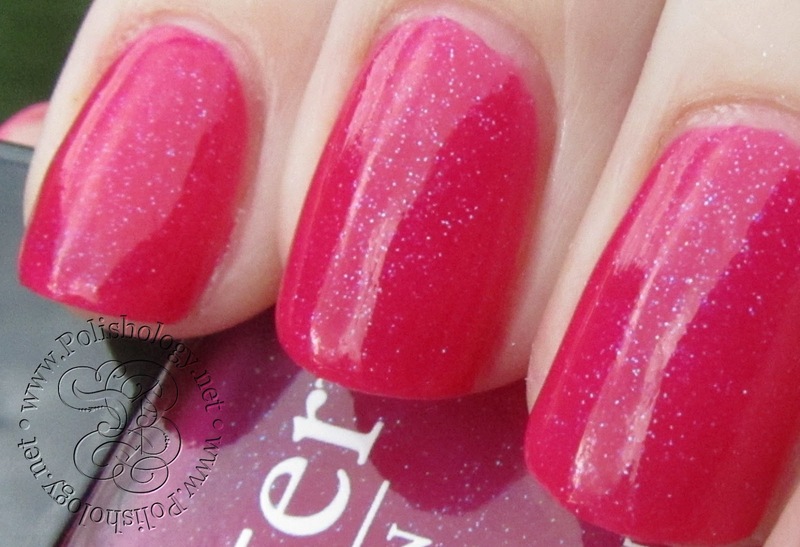 This is Butter London Disco Biscuit, a bright pink squishy jelly packed full of purple and silver microglitter. 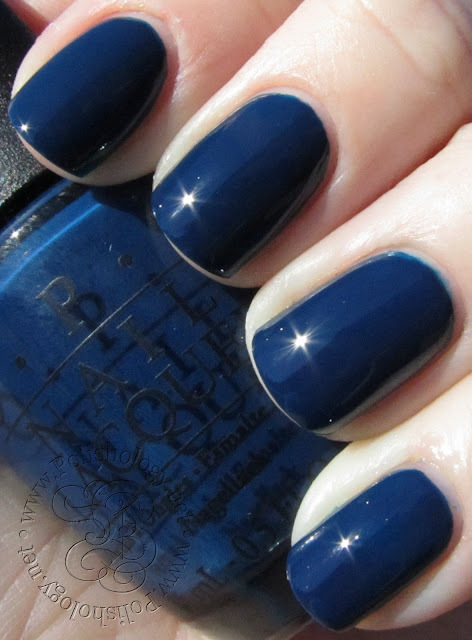 Gorgeous polish and great name. I can't remember how many coats this is, but I think it was three, but I do remember that it applied well. I stamped the purple hearts using Color Club Wild At Heart and plate RA-114. Thanks to Becky for letting me borrow this beauty! Happy Valentine's Day to all! I had originally planned on one final Valentine nail art today, but unfortunately I have been sick the last couple of days and wasn't able to get around to it. Instead, I chose a sparkly pink glittered look as my Valentine's Day manicure. Shimmer Amy is a multicolored mix of glitters featuring pinks, reds, and blues in a light pink jelly base. Here I used one coat over Orly Artificial Sweetner. Like all of the previous Shimmer polishes I have featured before, Amy applied perfectly and gave great coverage. I love the rainbow of colors in this one! 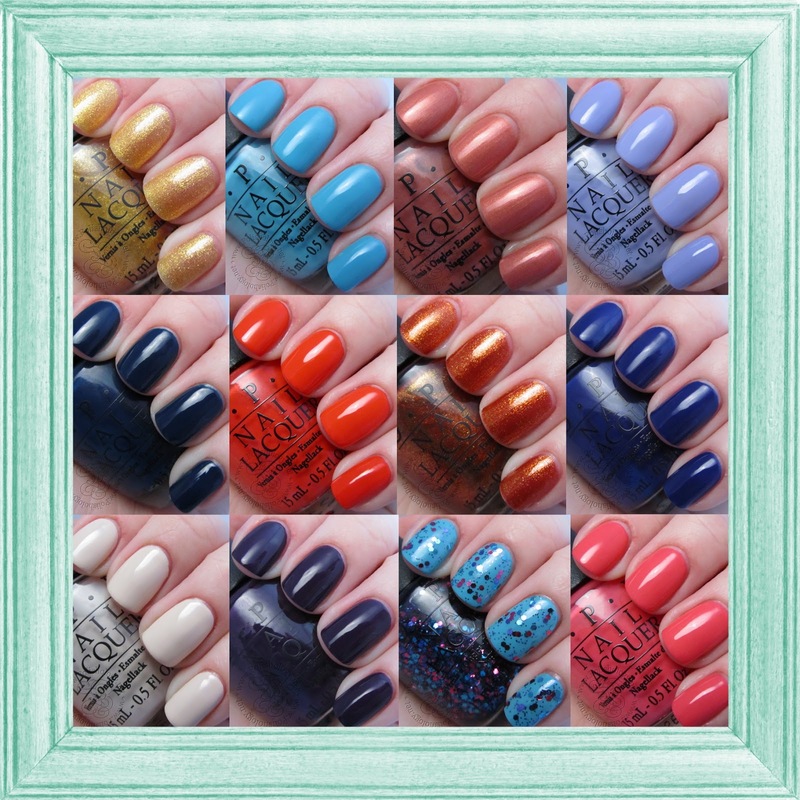 As always, Amy and other Shimmer polishes can be found at Cindy's Blog or Etsy Store. Hope you all have a fabulous day! Today I have for you all another amazing glitter from Shimmer - this time featured in some Valentine-inspired nail art. For this look, I started off with two coats Zoya Izzy on all but my ring finger (and thumb). For those nails, I used two coats of Shimmer Eva alone. Eva is a deep burgundy jelly with red and silver fine glitter. The layering of the jelly base gives it a lot of depth, making some of the silver glitters take on a pink hue. This applied really well and two coats gave full coverage. I then used Bundle Monster plate BM-317 and Zoya Trixie to stamp on the hearts, added Eva to the tips and used Trixie to create the silver line. This was a fun look and pretty simple to create. Eva looks great both on its own as well as layered, and as always I was impressed with the quality of the polish! Eva and other Shimmer beauties can be found at Cindy's Blog or Etsy Store! Happy Mardi Gras! While I don't have any fun celebration plans for the day (I mostly plan to go to work, come home, and study), I of course had to plan out a fun Mardi Gras manicure. For these nails, I used three coats of China Glaze Glitter All The Way, a multi-colored glitter made up of gold, green, purple, and red glitters in a clear base. As soon as I saw this color in the Holiday Joy collection, I just knew I would be wearing it for Mardi Gras! On the ring finger, I tried out my very first fishtail pattern using Zoya Ziv, Tru, and Holly. It was actually a lot easier than I thought it would be and I really love the look! I will definitely have to use this technique again soon. Hope you all have a great day! 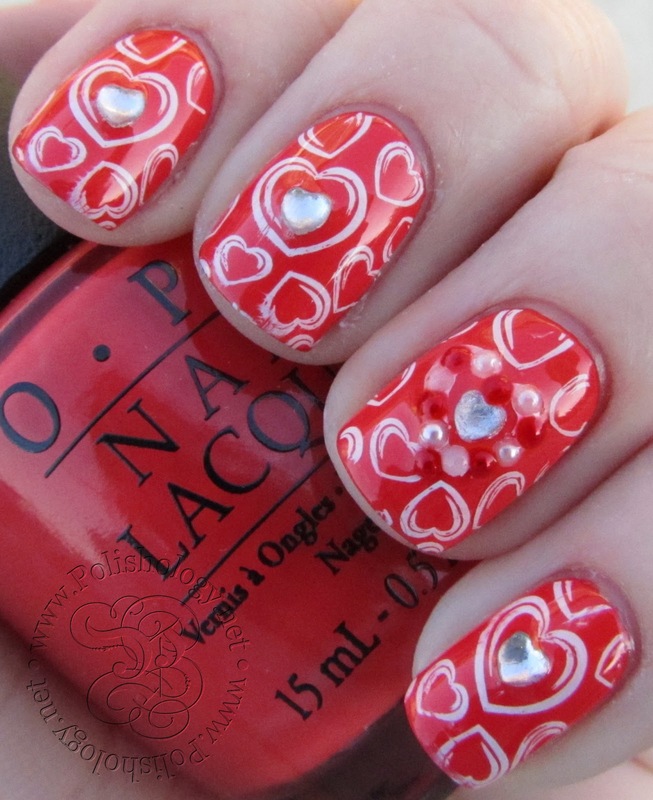 Quick post today - here is a stamping manicure I did with OPI My Paprika Is Hotter Than Yours and BM-317. Rhinestones and half-pearls from a Cheeky wheel. Hope everyone has a great Monday! Although I have been trying to hold off on buying many polishes lately (medical students don't exactly get paid... anything), I couldn't resist ordering a couple of KBShimmer polishes to add to my collection. I've seen so many wonderful pictures, it was hard to pick just two to start with, but I finally narrowed it down! Today I have for you nail art with KBShimmer Elle! Elle is a soft gray jelly base with dark pink, light pink, gray, white, and holographic silver glitters in a variety of shapes and sizes. I used OPI If You Moust You Moust (dark pink) and Nicole by OPI Up and Kim-ing Pink (light pink) to paint/dot on the hearts and tips. A very fun look for Valentine's week! Oy - Another Polish Joke! Orange-copper shimmer. This one only needed two coats to reach full opacity. Similar shimmer to Oy - Not Another Polish Joke. 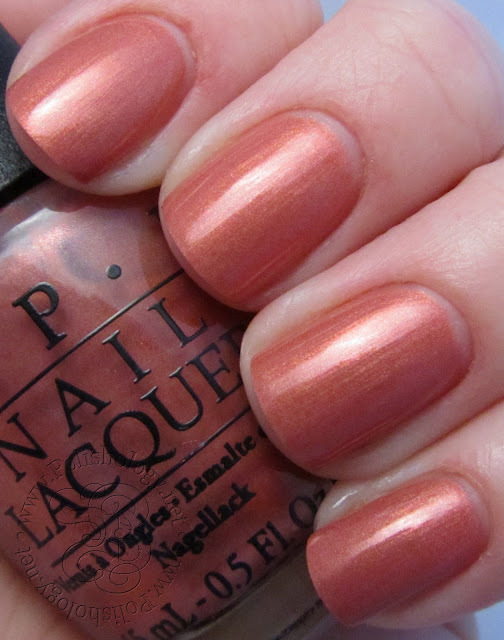 This shade seems to say "fall" to me more than spring, but it is really pretty, and has great formula. Medium-toned pinkish tan shimmer. This applied fairly nicely, but it does show some brush strokes. It has a little bit of a frosty finish, but is definitely not a full-blown frost. Overall I like it but I think I would like it a bit more if it was just a touch less frosty. The shimmer is actually really pretty in the sun, and the color is a fairly nice neural and I like it with my skin tone, so I will probably wear it again. Light lilac creme with very subtle shimmer. While you can see the shimmer in the bottle, it doesn't translate to the nail well, and honestly I could not see it at all in person. The formula was a touch streaky but evened out nicely in three coats. Love the color! Warm coral-pink creme with a touch of subtle shimmer. Just like with BudaPest, the shimmer doesn't really translate to the nail on this one. Application was good, not too streaky or thin. I used three coats here, although two was almost enough. Color is probably closest to the picture below, leaning a bit more pink than coral. Slightly dusty aqua blue creme. Probably doesn't surprise anyone that this is my favorite of the collection, haha. Great application in two coats. This polish has just enough dustiness to it to make it unique to my collection, but not so much that it overpowers the brightness of the color. Totally love this one! 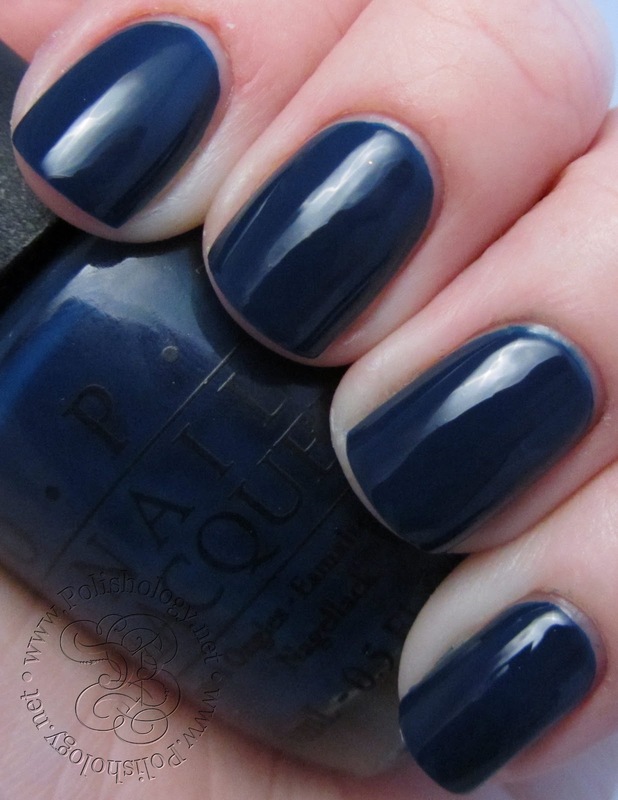 Dark blue creme. 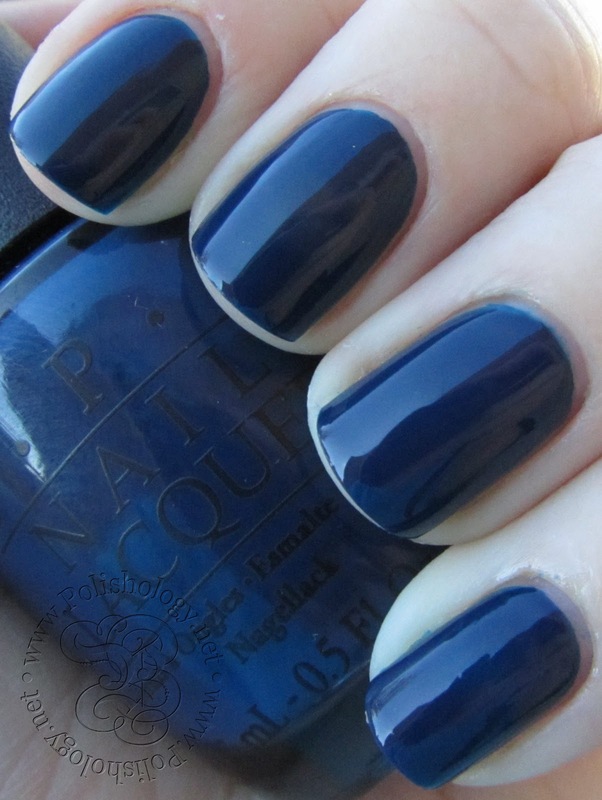 This blue leans a bit towards the dusty teal side of blue (in contrast to the next polish). I found the formula here to be a bit thin, and I had to be extra careful around my cuticles. However, with a steady hand it full coverage at two coats. Dark, bold blue creme. This blue leans towards the purple side of blue (in contrast to the previous polish). It too was a bit thin, but evened out very nicely in two coats. Deep eggplant purple creme. This is another one that feels much more like fall than spring to me, but is a very pretty color nonetheless. Great application, almost covered in one coat but I used two here. Light, yellow-beige creme. This one was a bit on the streaky side, but it evened out fairly nice with three coats. I am not sure how I feel about the color on my skin tone - I think there are probably other pale neutrals that match me better than this one. Bright, orange-red creme. This polish cannot seem to decide whether it wants to be an orange-red or a red-orange. It sort of varies depending on the light - above it looks orange, below it looks red. Either way, it had a wonderful application, and was almost a one-coater. Two coats smoothed it out completely. Fuchsia, purple, and teal glitters in a clear base. I was super excited about this glitter as this is one of my favorite color combos! 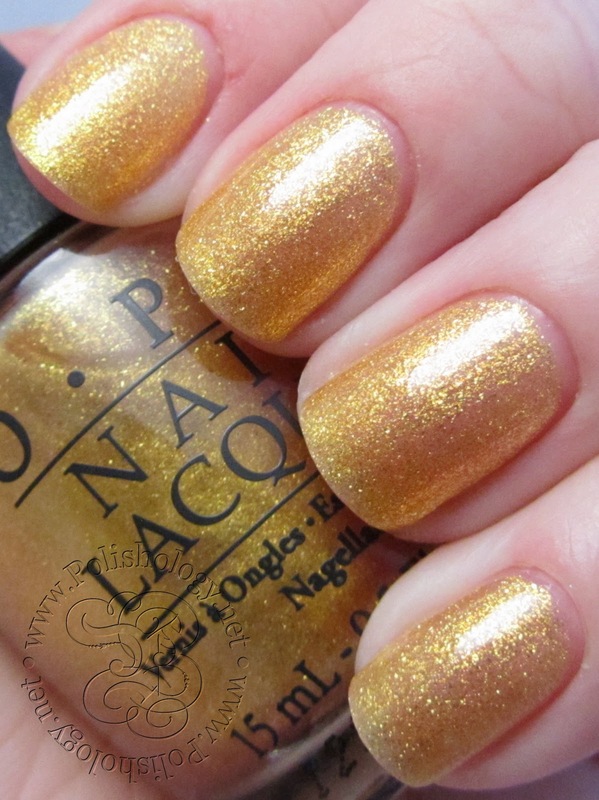 I think it's great OPI has been offering some fun glitter toppers recently - seems they are paying attention to the indie scene! This applied really nicely and gave great, even coverage with one coat. Shown is one coat over Can't Find My Czechbook. This collection contains a wide variety of polishes - cremes, shimmers, glitters, light shades, dark shades... you name it. The majority of the collection is fairly unique, and nothing is jumping out at me as easily dupe-able. A few of the polishes had application issues (streaky, thin, etc) but for the most part everything evened out nicely in the end and I have no huge complaints on application. My picks would have to be Can't Find My Czechbook, I Saw...U Saw...We Saw...Warsaw, Polka.com, and A Woman's Prague-ative, although there are several others that I liked quiet a bit as well. Overall I am pleased with this collection. With such a variety of colors and finishes there is definitely something for everyone here!